We have a bit of a theme going on for this week’s Monday Meow… cats that like to play their hearts out! We have cats and kittens of all ages, and many of them are so playful that their foster families caught it on video. Please enjoy these short video clips of our cats in their foster homes. We can’t thank our dedicated fosters enough for going above and beyond all the time. Sibling cats are so much fun to watch in action. These two are just hilarious how they play “tag” in this video, we just can’t get enough of it! If you’re looking for a cat duo to take your home from boring to exhilarating… this is the pair for you! Jamie (boy) and Jenny (girl) are sure to provide you years of entertainment! Click here to learn more about Jamie. If you’ve ever had a cat, you’ve likely experienced them choosing to play with the cheapest toy they can get their hands on. There are countless videos online of cat owners who ordered a cat tree online, unboxed it and put it together, yet their cat wants to play with the cardboard box it came in! Cats are strange creatures, but they are so fun to observe and hang out with. Here are two fun videos of Sierra and her most recent unconventional toys… a pipe cleaner and an envelope! 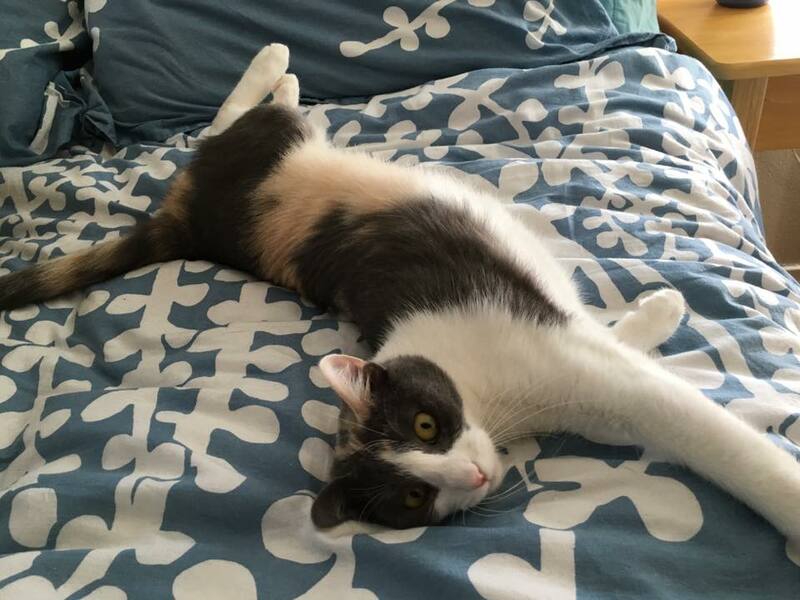 She is such an entertaining cat to her foster family, so if you’re looking for a fun and playful cat… she may be just what you’re looking for! Click here to learn more about Sierra. These 3 boys spend a lot of time together, but sometimes they like to go off and play on their own. 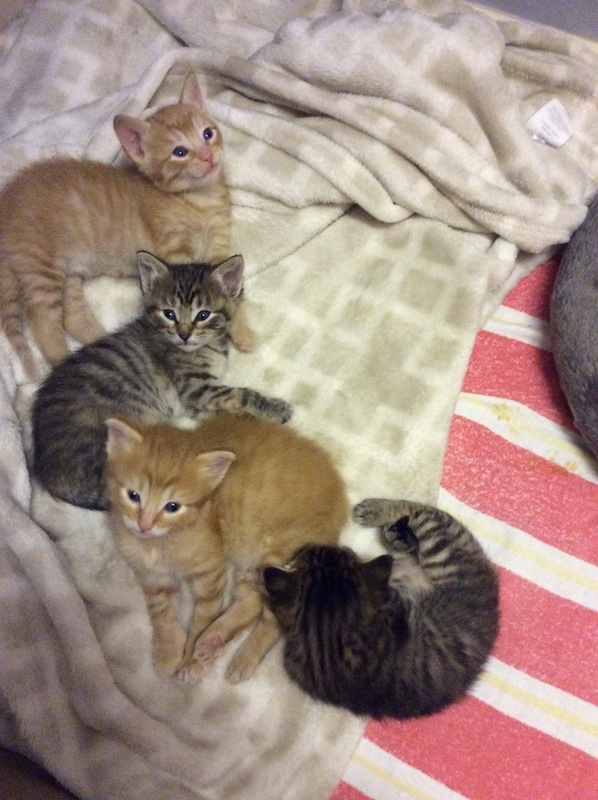 Here are 3 videos captured by their foster mom of them each playing on their own. If you’re not familiar with their story, these 3 were heard crying inside the walls of an office building when they were just babies. These boys are coming out of their shells nicely since being taken into our program. They’re about 10 months old, so they are almost adults but still active like kittens. We just cannot wait until the days they are adopted! Denny is a silver tabby with gorgeous green eyes. He is a little bit shy at first, but soon comes out to play and to be petted. He loves a good tummy rub. Click here to learn more about Denny. Sammy is quite shy. He is very dependent on his brothers to make him feel comfortable but when they give him the “OK” he warms up and loves to be petted and have his tummy rubbed. He’d likely do best in a home with one of his siblings or another cat that can show him the ropes. Click here to learn more about Sammy. Vinny is the bravest of the 3 boys and is an attention hog. He loves cuddles and playing with the laser toy. This boy rarely leaves his foster mom’s lap, as evidenced by the many pictures and videos we have of him chilling with her! Click here to learn more about Vinny. Denny, Sammy, and Vinny were caught on the security camera in their foster home recently! Their foster mom reports that they play like this all the time, what a fun bunch of teenage kittens. Remember Sebastian, our FIV and Leukemia positive kitty? He is doing well, and moving to his new foster home soon… and we could not be more happy for him! In the meanwhile, he’s been posing a lot for his current foster mom and of course she always has her phone nearby to snap these gorgeous photos of him. 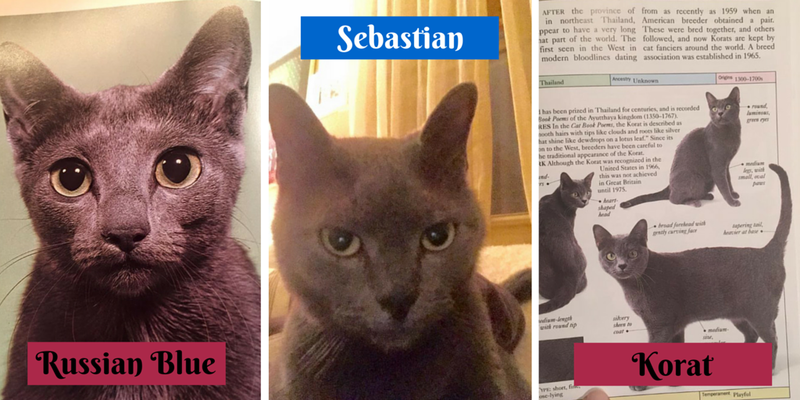 Recently we’ve been thinking that Sebastian resembles a Russian Blue cat or perhaps even a Korat. What do you think? Let us know on Social Media by posting to our Facebook page or tweeting us @tmhprescue! Stella is still enjoying life after having kittens. She is still under a year old, which makes her a pretty young momma cat. This is why it’s important to speak with your veterinarian about spaying or neutering as you may be surprised how young they can reproduce. Since both of her kittens have been adopted, she’s been spending her days playing with toys, laying on her foster mom’s lap, sprawling out for naps on the bed, and being pet. 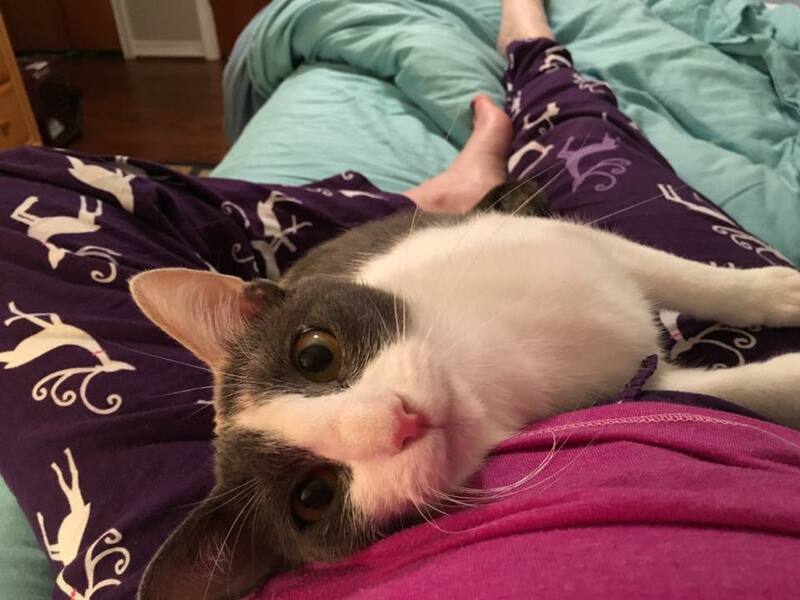 This girl is the best of both worlds – active and playful but also a lap cat that will sit while you work on the computer or watch TV. If Stella sounds like the kind of cat that would fill up your home and your heart, have your people contact her people… she’d love to meet you during our Meet ‘N’ Greet event sometime. Click here to learn more about Stella. It just doesn’t get any cuter than this! These little ones are at the age where they are developing personalities already. They love to play with each other and with little toys, and soon we will have them listed on our website for what we like to call “pre-adoption”. They won’t go to their forever homes until they have received first shots and been spayed or neutered, but this way they will be spoken for and not have to spend any additional time homeless (even though they are nice and comfy in their loving foster home). Once they are weaned, their mother Loki will also be looking for a forever home of her own where she can retire from a life of raising kittens. We’ll have updated photos of Loki for you soon. 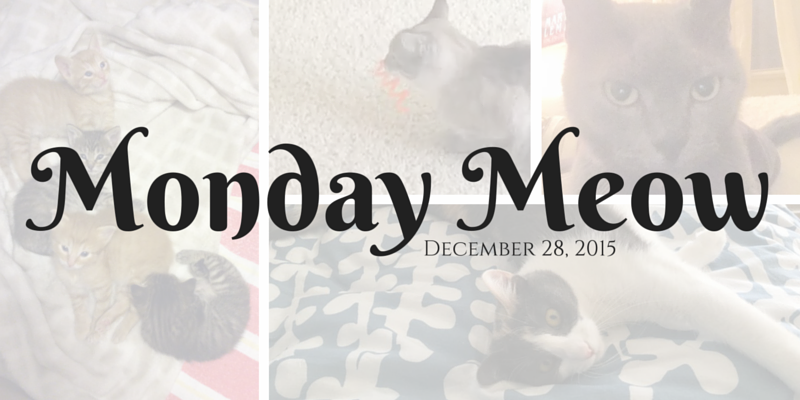 Thank you for reading our Monday Meow, our cats and cat team appreciate it!